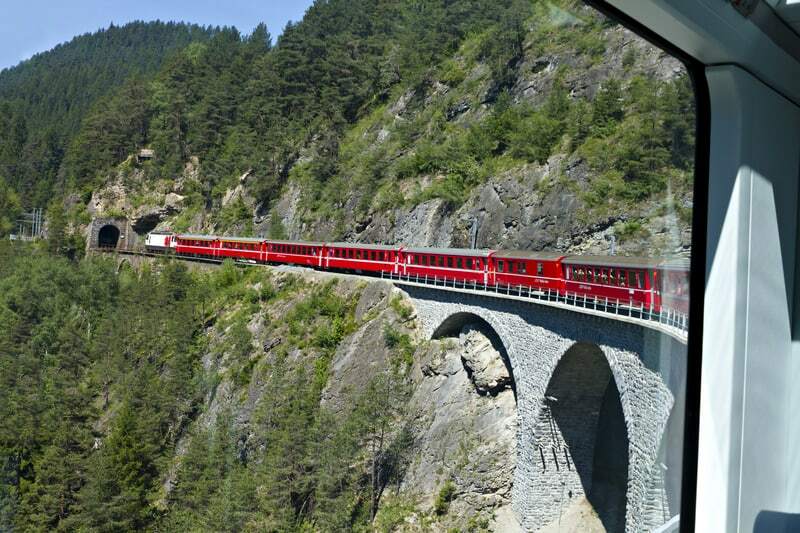 The Glacier Express might be billed as the slowest express train in the world, taking a leisurely seven and a half hours to travel through southeastern Switzerland, but it is one of the most panoramic train journeys in Europe. 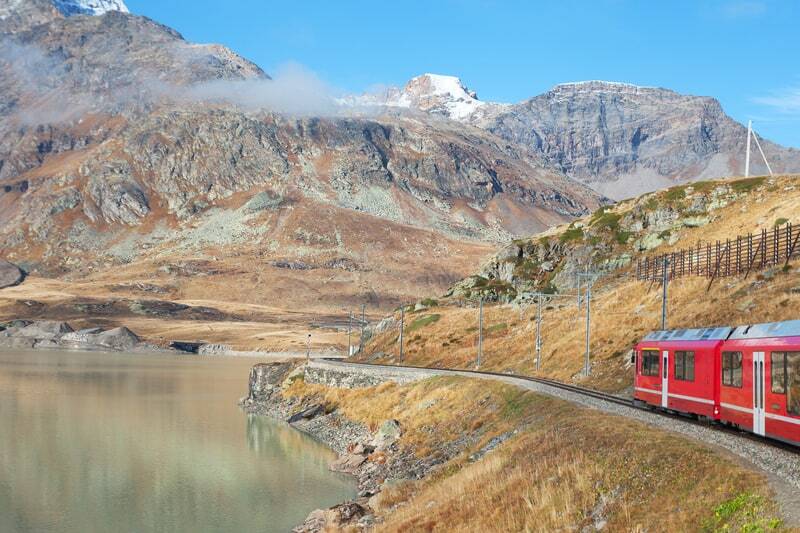 The train, which started running in 1930, travels between Zermatt – at the foot of Switzerland’s most photographed mountain, the Matterhorn – and the swish, upmarket resort of St. Moritz in the Engadine, perched upon its lake amidst forests of larch and fir. The route takes in spectacular alpine scenery along the way as it crosses 291 bridges and passes through 91 tunnels. The Oberalp Pass is the highest point of the journey at an impressive 2,033m above sea level and surrounded by thousands more meters of mountains.Starting the journey in St. Moritz, there are a number of scenic ascents and descents, up to the Albula tunnel (1,820m above sea level), then down to Chur (585m), up to the Oberalp Pass, down to Visp (650m), and up again to end in Zermatt (1,604m). Beyond the short Albula tunnel, the Glacier Express enters a series of corkscrew tunnels in order to lose 416m in altitude before Berguen village, 5km down the valley as the crow flies. A map of the journey can be found here. Lunch – three courses with wine and schnapps – was served in the elegant wood-panel dining car as the train climbed through the Surselva gorges. From every seat in the train the views are all-encompassing. In both first and second class, the windows extend right up around the top of the coach. 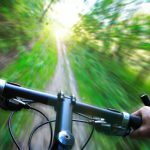 Highlights along the 274km track include the Albula UNESCO World Heritage landscape, the Graubünden valleys, steep, high and densely forested, mountain lakes and deep ravines formed by water that exhibit bizarre rock formations. 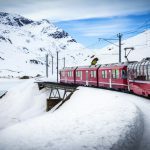 The Rhaetian Railway in the Albula/Bernina Landscape has been granted UNESCO World Heritage status – only the third railway in the world to receive such a listing. Tickets can be reserved from the Glacier Express website. 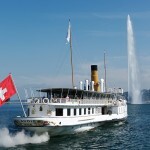 A full adult fare is CHF 149, children (6 to 16) CHF 74.50 and children under 6 free. Swiss rail passes and discount passes can all be used.